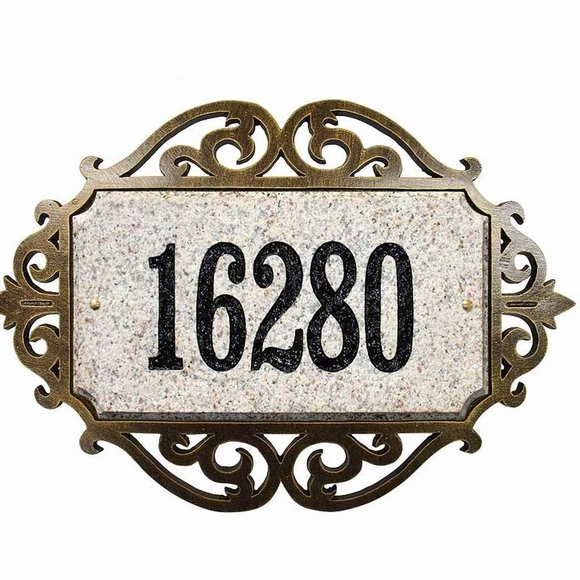 Personalized Solid Granite Address Plaque with Scroll Frame - - cut-corner rectangle solid granite address sign with distinctive and decorative cast aluminum scroll frame. Made of solid granite with natural stone texture. Holds up to five deeply engraved 4" numbers. Sign colors: black polished, white granite natural, five color natural, autumn leaf natural, quartzite. Number colors: gold, white, black, mocha (note: not all number colors are suitable for all sign colors). Frame colors: black, white, french bronze, swedish iron. Optional lawn stakes sold separately; see Related Products.